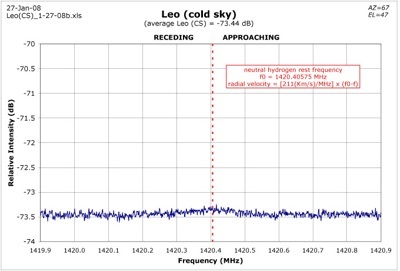 Measurements were made centered on 1420.4 MHz with a span of 1 MHz about that center frequency (i.e., from 1419.9 MHz to 1420.9 MHz) while pointing the dish at various longitudes in the galactic plane (i.e., galactic latitude of zero degrees). Our solar system is located within the Milky Way galaxy approximately as shown in the diagram below. 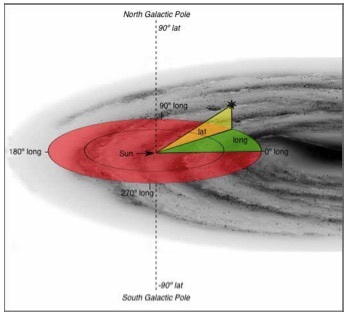 The diagram shows how the galactic coordinate system is oriented in the Milky Way galaxy. Note that the galactic coordinate system is centered on our solar system with zero degrees longitude directed toward the galactic center. where v is the radial component of the relative velocity between the observer and the source, c is the speed of light (3 x 10^8 m/s), fo-f is the Doppler shift amount, and fo is the unshifted frequency. By arbitrary convention and agreement among astronomers, Doppler-shifted velocity components in directions that are away from the observer are designated as positive whereas Doppler-shifted velocity components that are directed toward the observer are designated as negative. Ref: above image was obtained from http://www.thinkastronomy.com/M13/Manual/common/galactic_coords.html without permission. 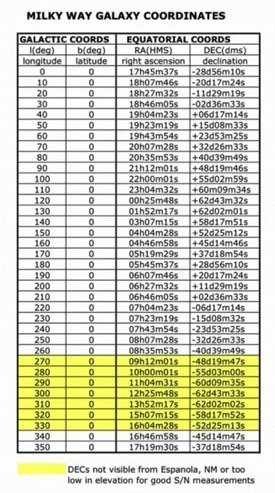 In order to track specific galactic longitude/latitude directions with a radio telescope it is necessary to convert galactic longitude/latitude coordinates into Right Ascension/Declination equatorial coordinates and, of course, ultimately to convert RA/Decl coordinates into Az/El coordinates for the particular telescope location being used and the time of day of the observation. The conversions to equatorial coordinates for galactic longitudes within the Milky Way galactic plane, i.e., at zero degrees galactic latitude, are shown below. 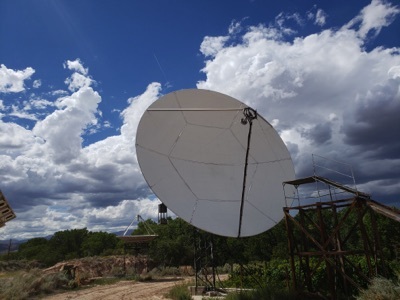 Note that some galactic longitudes are not visible from my New Mexico location. The following plot is a summary of measurements taken at a variety of longitudes at zero-degree latitude, in the galactic plane of the Milky Way at 1420.4 MHz. 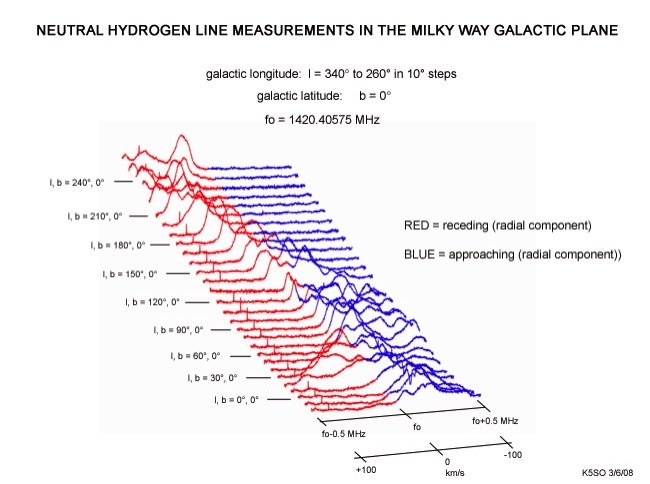 Peaks in the RED portions of the curves indicate neutral hydrogen gas that has a radial component of velocity that is receding from us and peaks in the BLUE portions of the curves indicate neutral hydrogen gas that has a radial component of velocity that is approaching us. 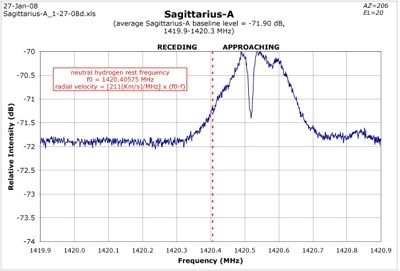 Each curve is a result of signal averaging for a period of 5 minutes at the specific longitude/latitude direction as the dish tracked the movement of that galactic direction through the sky during the measurement. 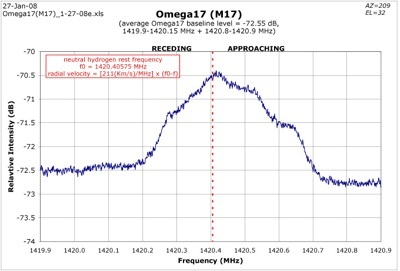 The following graphs are 'signal-averaged-intensity versus frequency' plots obtained directly from the SDR-14 using the SpectraVue program in its normal (default, frequency domain) mode with a 1 MHz bandwith centered on 1420.4 MHz and an approximate 10-minute acquisition time for each. The data were initially saved using the spreadsheet output format option of the SDR-14/SpectraVue then imported into MS Excel as a text file. The data were plotted and annotated using the Chart Wizard feature in Excel. The resulting chart was then printed to file in PDF format and converted into JPEG format using Adobe Photoshop Elements for posting on the website as a JPEG image. 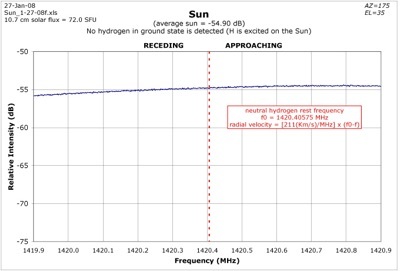 Neutral hydrogen at rest (in the radial direction) with respect to us would appear as a peak precisely centered on the dashed red line at 1420.40575 MHz. 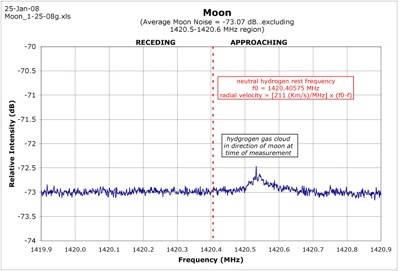 Peaks appearing higher in frequency than the red dashed line are due to hydrogen gas approaching us radially and peaks appearing a frequencies lower than the red dashed line are due to hydrogen gas receding from us radially. No information is available in these data with respect to velocity components of the gas that may be perpendicular to the line of sight. 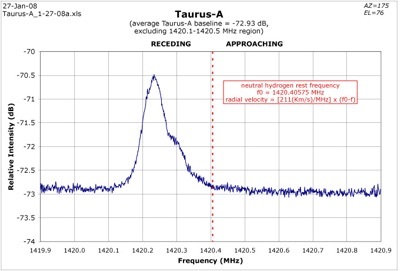 The H I line signals shown in these graphs are on top of, i.e., combined with, the broad-band background radiation from the sourcces. 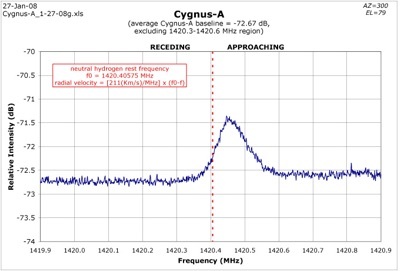 That is, at 1296 MHz for example, one would see only broadband radiation from these sources without the H I line peaks shown below. 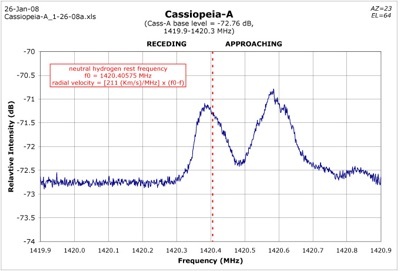 No calibration noise pulses were used during the collection of these particular HI line data. The noise pulses will be used in later measurements when the system is configured as a radiometer incorporating PIN diode rf switching and a synchronous, lock-in amplifier detector (not shown in the configuration diagram above) to obtain absolute power measurements of radio sources.